AllegroMedical.com presents The BARRIER™ Protective Goggles. BARRIER™ Protective Goggles Can be worn comfortably over eyeglasses. Wraparound seal and built-in nose piece guard against splashes from all angles. These goggles are great for Ebola, MERS, Flu and other airborne virus protection. 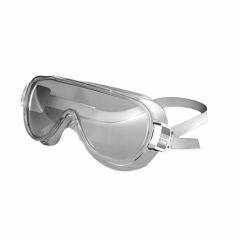 These safety goggles block alpha particles and low-energy beta particles from entering your system. Ebola hemorrhagic fever is a severe and often deadly illness that can occur in the human body. Health organizations recommend to avoid areas in which there are epidemics. For full protection its ideal to wear a gown, gloves, and mask around sick patients. These precautions will greatly decrease the risk of transmission.